I don’t know about you, but I discover many great recipes on social media channels. Someone will share a recipe or I’ll see one of those cooking videos that makes preparing a dish look so easy that I’ll seek out the blog or Facebook page it originated from. That’s how I found Gina Homolka and Skinnytaste. I can’t remember which recipe of hers I tried first, but I love how she uses real food ingredients in her dishes and includes the Weight Watchers points for anyone who may be on the program. She also has many slow cooker offerings. I’ve saved many of her recipes and cooking videos on Facebook and Instagram, so when I came across the Skinnytaste Fast and Slow cookbook a few months ago while browsing in our local independent bookstore I made an impulse buy. It didn’t disappoint. 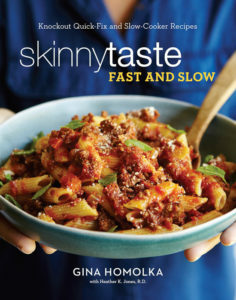 Skinnytaste Fast and Slow: Knockout Quick-Fix and Slow Cooker Recipes includes 140 dishes that can be made in a slow cooker, in the oven or on the stovetop. At the beginning of the book, Homolka explains her cooking philosophy–she loves eating decadent and savory foods but doesn’t want to sabotage the results of her fitness routine. That’s what led her to experiment with different dishes that could be full of flavor but still healthy. She also gives tips on how to successfully get dinner on the table even in the midst of a hectic schedule. For example, stock your pantry with seasonings and spices, baking products, canned and jarred goods, prep for the week with meal planning (she also sells her own meal planner to help with this), how to freeze certain dishes, etc. She also provides advice on how to prepare delicious meals quickly and slow cooker secrets. Plus, there’s a handy chart with a month full of meals to get you started. I’m still working my way through the cookbook but so far we’ve loved pretty much everything we’ve tried and I haven’t even attempted any of the breakfast or dessert recipes yet! Anyone who knows me knows I love to cook. This wasn’t always the case–ask my husband about the slop I used to try and whip up for us when we first got married. There was a LOT of processed food and frozen dinners thrown in there. Then when I was pregnant with our first child and we were both working demanding jobs, there was mostly take-out. Slowly I started cooking more, little by little, but I was still using a lot of processed ingredients (like those yummy condensed soups) because that’s all I knew. Several years ago I came across the 100 Days of Real Food blog and was happy to find recipes that included nothing but whole food ingredients. If you don’t know about the family behind the blog, including mom and Charlotte, N.C. resident Lisa Leake, you can read more about their story here. I absolutely loved the first cookbook and learned so much about what is considered real food and what has added ingredients. I found so many great recipes I added into my usual rotation, such as the Slow Cooker Potato Soup, Slow Cooker Fajitas, Mini Quiches (my daughter even makes these herself now! ), Whole-Wheat Pasta with Kale-Pesto Cream Sauce, etc. 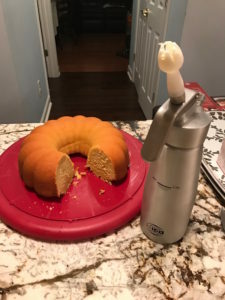 I also learned how to make my own whipped cream and it is yummy! 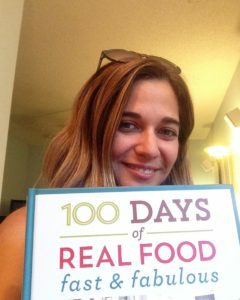 The second cookbook Lisa Leake released, 100 Days of Real Food: Fast & Fabulous, features a whole slew of ways to help you integrate healthy, real food into the household with quick and simple recipes. I ordered this cookbook the second I realized it was coming out. 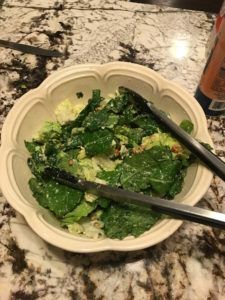 Some of my favorite recipes include Layered Jar Salad with White Beans, Quick Cauliflower Soup, Kale, Sausage and White Bean Soup, the Orange Cream Bundt Cake, Fresh Ranch Dressing (my kids won’t eat the stuff out of a bottle now–they will only eat this!) and much more. One recipe I’m dying to make but haven’t yet is the Cheesy Hash Brown Casserole (like Cracker Barrel’s but without the MSG and other additives). Also, these brownies are delicious and my kids can make them without my help! The book also includes make-ahead meal suggestions that don’t require a recipe, such as hard-boiled eggs, cooked quinoa, granola, hummus–things that are great for lunch boxes and the days/nights when you want to feed everyone quickly but without grabbing fast food. There are also meal plans for each season that include shopping lists to make things so much easier. These two cookbooks have become a staple in our house when meal planning and I can’t wait for her next one to come out.